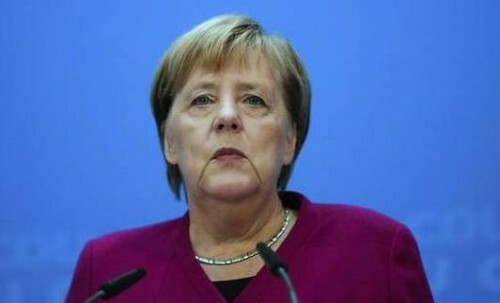 Berlin : German Chancellor Angela Merkel on Thursday said there is "no military solution" to the conflict between Moscow and Kiev, after Ukrainian President Petro Poroshenko urged NATO to deploy warships to a sea shared by the two nations following a naval confrontation in waters off Crimea. Poroshenko's request came following the confrontation with Russia on Sunday where the latter opened fire on three Ukrainian ships and seized their crews in the Kerch Strait, the BBC reported. Merkel blamed the crisis on Russian President Vladimir Putin, but said "issues like these can only be solved by sensible dialogue". Talking to Germany's Bild newspaper, Poroshenko said: "Germany is one of our closest allies and we hope that states within NATO are now ready to relocate naval ships to the Sea of Azov in order to assist Ukraine and provide security." "We cannot accept this aggressive policy of Russia. First it was Crimea, then eastern Ukraine, now he wants the Sea of Azov. Germany, too, has to ask itself: what will Putin do next if we do not stop him?" A NATO spokeswoman did not comment on Poroshenko's request for warships, but said that "since Russia's illegal annexation of Crimea in 2014, NATO has substantially increased its presence in the Black Sea". The Kremlin said Poroshenko's request looked designed to cause more tensions in the area. Putin accused Poroshenko of creating the naval "provocation" to boost his ratings ahead of the 2019 elections. Ukraine's Infrastructure Minister Volodymyr Omelyan accused Russia of imposing a de facto blockade on two Ukrainian ports on the Sea of Azov by barring vessels from leaving and entering the sea via the Russian-controlled strait of Kerch, the Guardian reported. Russian state media reported that Moscow delivered a battalion of S-400 surface-to-air missiles to north Crimea and also has plans to build a new missile early-warning radar station there. Poroshenko also called on Germany to halt the undersea pipeline Nord Stream 2 project that would allow Russia to supply more gas to Germany directly. "We need a strong, resolute and clear reaction to Russia's aggressive behaviour," Poroshenko told the German media group Funke. "That also means stopping the Nord Stream 2 gas pipeline project."